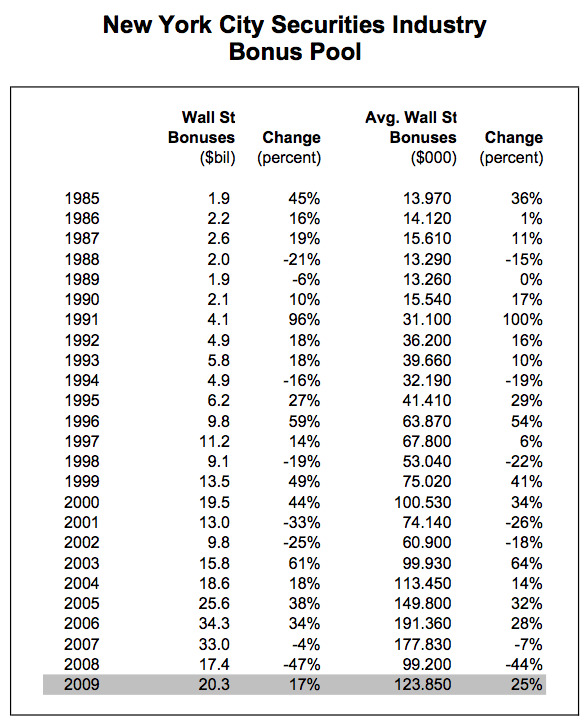 The Wall Street bonus pool rose 17% and average bonus per person rose 25%. Wall Street bonuses paid to New York City securities industry employees rose by 17 per cent to $20.3 billion in 2009, according to an estimate released today by State Comptroller Thomas P. DiNapoli. Total compensation at the largest securities firms grew even faster and industry profits could exceed an unprecedented $55 billion in 2009, nearly three times greater than the previous all-time record. In 2008, the industry lost a record $42.6 billion. On the surface this sounds like there will be a big jolt to the NYC regional economy. The sector is an important economic engine, providing 25% of the income from 5% of the jobs. Every job lost on Wall Street causes the loss of 2.5 private sector jobs. The higher growth in bonuses are bittersweet – while the average per person bonus was up because there was job loss in the sector. Arguably few jobs lost than forecast but it tempers the bonus impact on the real estate economy. But bonuses are controversial especially when so many are struggling outside of Wall Street. President Obama fell prey to populist sentiment with his “Fat Cats on Wall Street” comments but now doesn’t “begrudge“ them (I’ve never been able to use begrudge in a sentence before). Bonus income accounts for as much as 50% of total compensation for an individual. My anecdotal feedback is that compensation seems to be about 70% restricted stock and 30% cash. And institutions like UBS are reportedly paying out half of the cash compensation now and half in 6 months. That knocks the wind out of the “sales” (sorry) for a spring frenzy in the NYC housing market that has grown accustomed to a frenzy over the past decade. Still, it will help but I am sceptical about it helping above seasonal expectations, but who really knows.